The latest fixtures and fittings are all designed to combine style with unfailing practicality. Whether you are creating a new en-suite bathroom in a limited space, or ripping out the tired old avocado suite to create a modern family bathroom the same principals apply to achieving successful design. Is your penchant for the sleek lines of a modern hotel style bathroom, comfortable country chic or glamorous period drama? Do you envisage yourself submerged in luxurious bubbles in a Victorian style roll top bath, or prefer to spend more time feeling the refreshing force of a powerful shower? Choose your look and then begin to research your products, starting with the bath, and the rest will soon follow. And always be sure to sit in a bath before you buy – style should never override comfort! For period styling, a freestanding bath can become the focal point of even the smallest bathroom with traditional styles now available under 1500mm long. Think carefully about the style and position of the taps; will a double ended bath with central taps work for you, or should you opt for a slipper bath with the taps at one end? 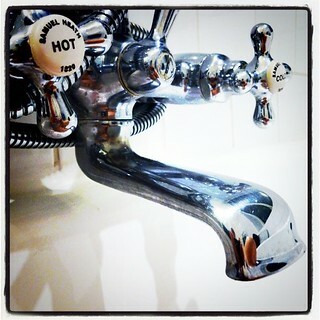 Do you require classic telephone taps for a handheld shower? For a modernist look, consider opting for a shower bath, combined with a large chrome modern showerhead, and glass screen to give the illusion of more space. Create country or coastal style by choosing wood panelling on the side of the bath instead of matching panel, and decorate to suit be it with white wood panels and feminine country wallpaper, or cool blues, greens and greys to the colours of the sea. A real sanctuary has to be clutter free, and it is worth spending time planning effective storage.Whilst short projection toilets and basins are a great way to maximise floor space, a vanity unit may be the best way to create concealed storage space. Vanity units are available to suit all styles; from luxurious glossy granite to top mounted solid wood units. Use recesses in the bathroom walls to keep toiletries close to hand, or look at floor to ceiling corner cabinets for the storage of towels and spares. If you are creating an en-suite bathroom as part of a loft conversion, be sure to install a large velux window to flood your room with as much natural light as possible. Choosing white floor coverings and keeping walls white help to bounce light around for an extra feeling of space, and introduce colour with carefully chosen linens and accessories. Consider adding lighting in wall recesses for warmth and atmosphere, and choose a mirror with inset LEDs for gentle yet effective lighting plus built in demister for less frustration! And finally, when its time to relax in your newly created haven, don’t forget the scented candles! Abbey Lofts are experts in creating loft conversion bathrooms in small spaces. Find out how much value a loft conversion can add to your home and visit the site to get some inspiration for bathroom designs.